Para-Equestrians at CDI at Lamplight Equestrian Center in Wayne, Illinois. Photo ©2010 C Mike Tomlinson DVM. Thousands Oaks, CA – June 7, 2010 – The United States Para-Equestrian Association (USPEA) would like to announce that it is now a 501(c)(3) public charitable organization. The USPEA provides programs, clinics, and competition opportunities for athletes with physical disabilities. 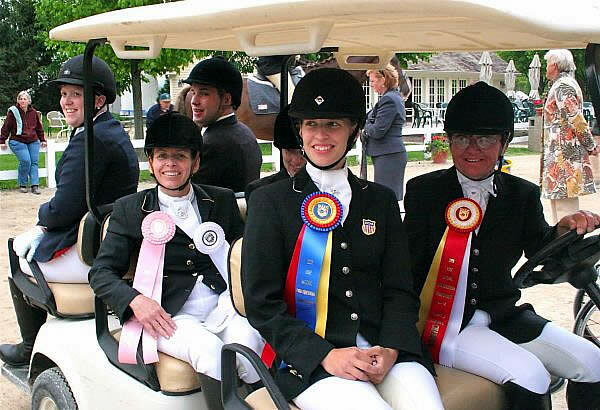 Riders compete under the United States Equestrian Federation (USEF) rules during their competitions and many of the athletes compete at the highest level of their sport. Becoming a 501(c)(3) was a momentous occasion for the USPEA. This status will encourage donors, supporters, and equestrian enthusiasts to supply funding for the United States Para-Equestrians. The show season of 2010 is going to be exciting for the USPEA as it will be the first year that the Para-Dressage discipline will compete on the world stage at the 2010 Alltech FEI World Equestrian Games in Lexington, KY. As the number of Para-Equestrian participants expands and more of the public becomes aware of this unique equestrian discipline, the Para-Equestrians will continue to need more support. The USPEA would like to see this type of benefaction continue through the World Games, the 2012 London Olympics, and beyond.